When your pets are considered part of the family, it seems almost cruel to jet off on vacation without them. Luckily, petcations are becoming more and more popular. Here, we reveal the best hotels for pets in North America, no matter what type of vacation you seek. Set on a golf course in British Columbia’s famed Okanagan Valley, domesticated animal friends are welcome in the lodge and cottages at Predator Ridge Resort. Better still, this is one of the few North American golf courses that allows owners to hit the links with their dogs by their sides. My husband and I experienced this resort firsthand with our dog, Buddy. The two of us humans regret not exploring all the many miles of maintained walking trails. We were too busy wine touring! Meanwhile, Buddy loved his large balcony and sat patiently at the pet-friendly stations peppered along the property while we nipped in for a few groceries or a drink. You’ve gotta love hotels for pets that don’t charge extra for your animal companion. Better still, there’s no restriction on weight or breed here. That’s right, lizards are welcome, too! Steps away from Pioneer Court Square, you can’t beat the downtown Portland location at Kimpton Monaco Portland. In researching the best hotels for pets, I knew I had to include Cypress Inn. Remember Doris Day? The perky blonde actress at is alive and well (at 93-years-old! 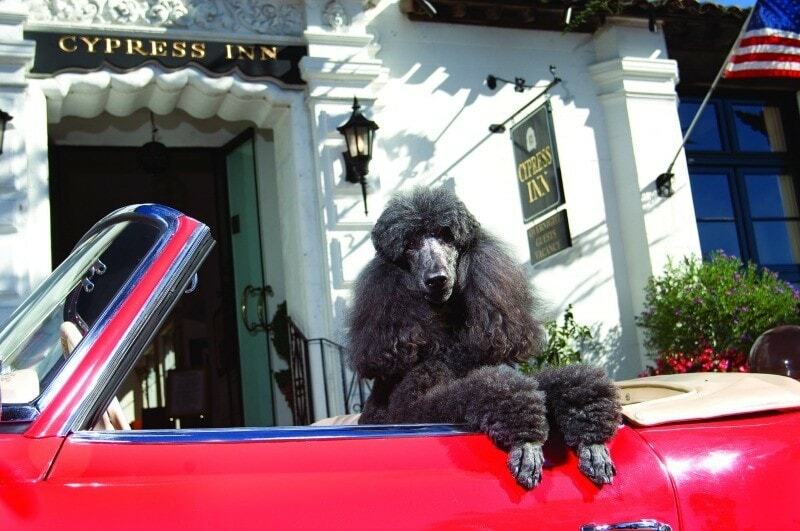 ), and running one of the best pet hotels in the country: Cypress Inn in darling Carmel-by-the-Sea, California. Staying at the historic property is an elegant affair with dog blankets, bowls and treats supplied. Be sure to hit the 35 acres of trails at Mission Trail Park and the fabulous Carmel Wine Walk by-the-Sea. Dogs run free on Carmel Beach, and this resort offers a pet specific spot to wash them off before returning to your room. I bet my furry pal, Buddy, would love it here! Carmel has become a haven for pet lovers, with all sorts of hotels for pets to choose from. 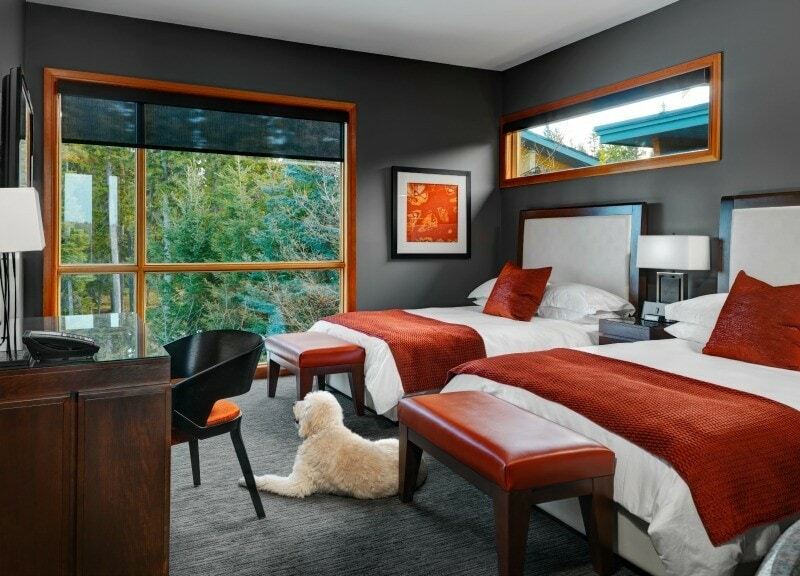 Read The Travel Mama’s review of Carmel’s Hofsas House Inn for another pet-friendly option. 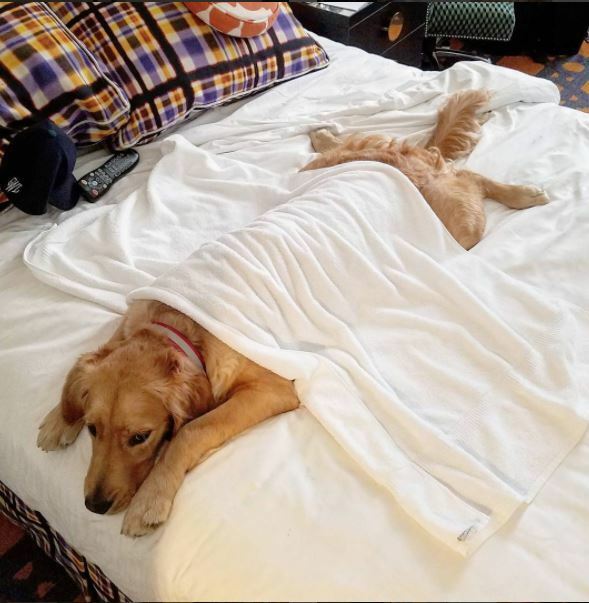 While most of these hotels for pets cater to traveling dogs and cats, animal lovers need not be pet owners to get some cuddles during their travels. Situated in Kanab, Utah, Best Friends Animal Sanctuary Cottages and Cabins is the nation’s largest no-kill animal shelter. It’s also located in a beautiful canyon with hiking trails and wildlife. There’s plenty of lodging nearby with cottages and cabins to rent in addition to RV spots. Some even offer discounts to those who volunteer at the sanctuary. Perched in the rolling foothills with epic views of the Canadian Rockies, the Spielberg clan regularly beds down at Azuridge Estate Hotel. You need not rent out the entire rambling estate set on 13 acres of rambling countryside, either. Any of the 14 guest rooms, each named and themed after a gemstone, will do. My family didn’t need to bring a thing for our beloved Buddy when we visited Azuridge. All pet guests are provided with a bed, water bowl and food. Butler service is offered to all guests, two- or four-legged. You can ask the butler to walk your dog or draw a bubble bath. If you’re just dipping a paw into pet travel, this resort makes it super easy. This oceanfront resort welcomes pets at no extra charge. 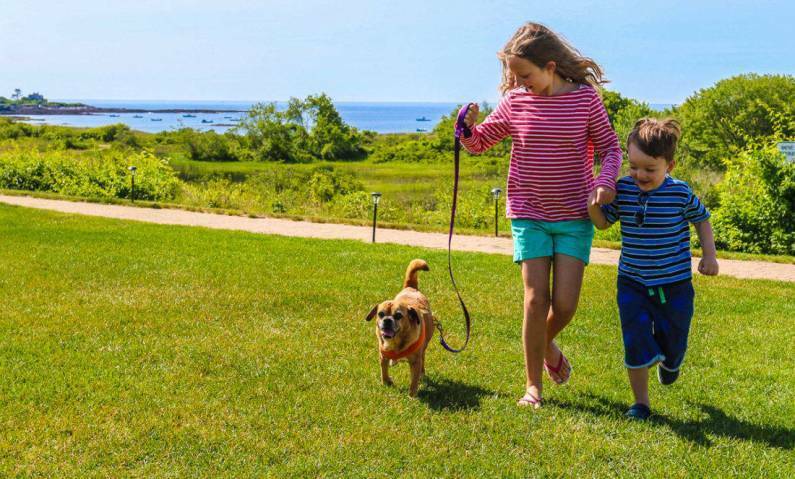 Animals receive their own special perks at Inn by the Sea, such as welcome amenities and gourmet pet menus. Dog walking and doggie daycare are available in addition to (get this!) pet massages. Nearby are pet-friendly beaches and free range parks. Located 80 miles east of Seattle, this year-round resort offers a spa, three championship golf courses, plus miles of hiking and biking trails. 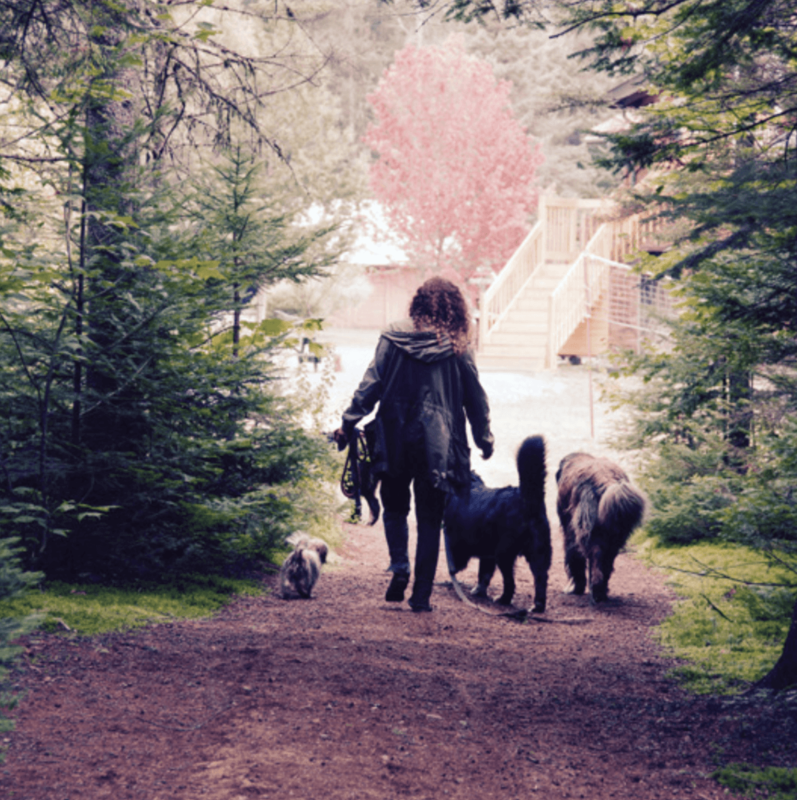 An off-leash park is the icing on the cake at Suncadia Resort. B&B means bed and biscuits when staying overnight at this luxurious nature retreat. Set on 200-acres in Quebec’s stunning Laurentian valley, Domaine Summum property lies mere minutes away from Mount Tremblant. So many people in eastern Canada have recommended this resort to me. In fact, there’s so much dog information on their website, I had to call and ask if they accept human guests! (They do.) You get a total break from being a pet owner here – if you want it. They offer doggie day camps, grooming services and chef-made meals delivered to your room, or five-bedroom cabin. With this incredible selection of hotels for pets, there’s no reason not to pack up the kibble and hit the road with your furry friend! Before you go, read our tips for traveling with pets to ensure your petcation is a success. Which of these hotels for pets would your family like most? Have you stayed at any other incredible hotels for pets? Let us know in the comments below! Cat image at top by bzyxx, Depositphotos.com. Thank you so much for sharing this! We have two dogs, and they are definitely like family to us. We’re always looking for pet-friendly hotels when we travel so we don’t have to board our babies. I know, I hate boarding. Our rescue dog just can’t handle the stress of it. I love that hotels are becoming more and more pet friendly. It makes it easier for us to take a vacation because we don’t need to look for somebody to take care of the dogs when we want to go. I will definitely take note of all these hotels. I hope you do. Thanks for commenting! Your list is very comprehensive. Thanks for the info. Thanks for reading Travel Mamas! I love being able to travel with our dog. It makes me so sad when we go away for extended periods of time. What a great resource. I think it’s wonderful that people can bring their pets long without having to worry about good accommodations. Love this list of hotels. Such a great post and great hotels. We have two dogs and have a hard time traveling at times because hotels won’t accept pets! Facetime the manager or send them a YouTube video of your well behaved pets. Exceptions can happen…. People love to travel with their pets! These sound like wonderful places to stay with your furry companion. They really are. Let me know if you get to stay at any of these. What a great list! 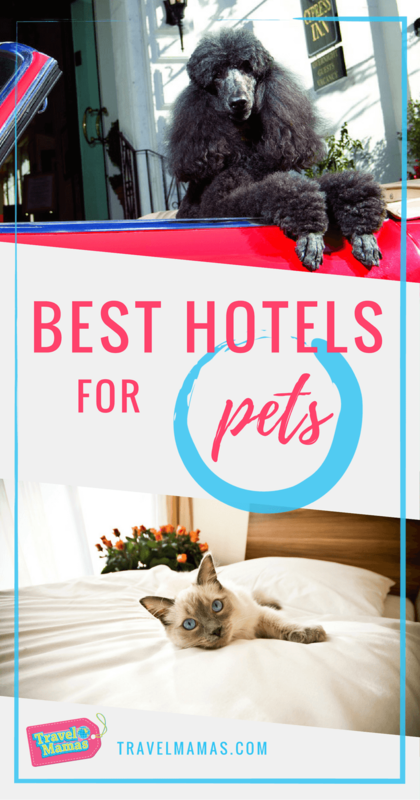 I know many people who travel with their pets and are always looking for hotels that will accommodate animals. I love that their are hotels for pets. I wish more would do this too. This is a wonderful list. Thanks so much! Yes, I wish more establishments would, too! I never thought to bring my dog with me on vacation. 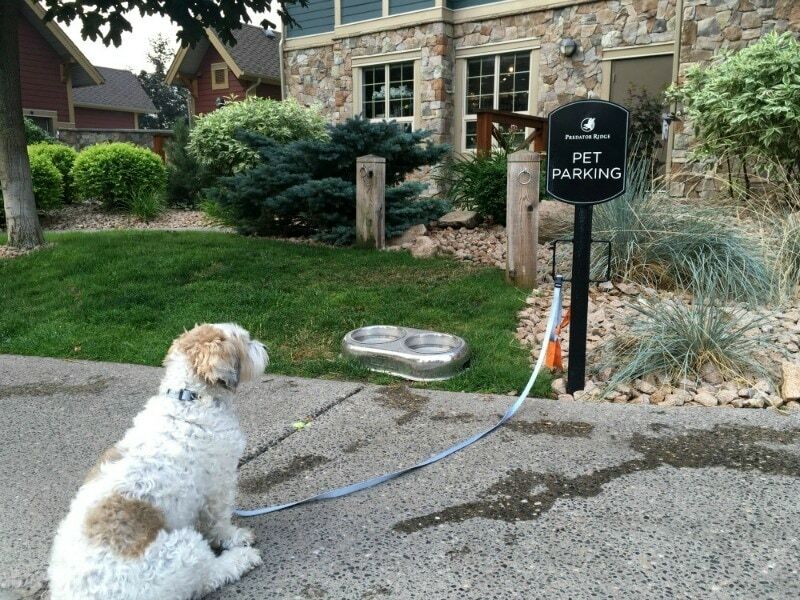 I think it is really neat though that some hotels accommodate dogs. It’s actually super fun. Let me know if you try it. There are so many places that accommodate pets nowadays … I’ll have to consider traveling with my dog one of these days. There are so many. I”m always annoyed when I arrange for a dog sitter and then go to a place that’s pet friendly. Happens a lot to me. The Cypress Inn sounds like such a great place. I really like how far they go to make pets comfortable! All of these places sound nice! What a fun list! So many people like to travel with their furry friends, that this is great information to have. I hope you do save it. Let me know if you hit any up. What an awesome list! This is perfect for people that travel with their pets. I’ll be saving this! These are awesome! Thanks for this list! Will be sharing this with my friends traveling with pets. No, thank you! I’m glad you found it useful.